The Hamilton Co initiated a 10-year, $100M plan to build new multifamily housing in the Packard Corner district of Allston. It broke ground Thursdayon a six-story, 49k SF building in a parking lot it owns at 40 Malvern St. The 61-year-old company plans to build on its existing property because acquisition prices have gotten too high, says CEO Harold Brown. Hamilton management, led by president Carl Valeri (third on right), includes Harold's son Jameson Brown (far right). 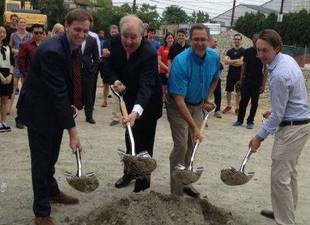 Also digging—John Ladt, Mayor Walsh's Neighborhood Liaison, and State Rep. Kevin Honan.